If you’re an audiophile of a certain age you might well remember your first look at color TV. I do. On a Sunday evening our family sat in front of a spanking-new RCA Victor console model, an enormous (for the era) 21” CRT encased in a walnut cabinet extravaganza that weighed in at a couple hundred pounds, if it weighed an ounce. What I most recall about that night was the appearance of the NBC network logo that preceded its “In Living Color” lineup. It was a stylized rendering of a peacock that famously fanned its resplendent tail-feathers, which up to that point, I had only seen in black and white. As the bird produced its display of plumage, my eyes popped and my jaw dropped (seemingly in unison) at the dazzling burst of rainbow colors that filled the screen. What does this have to do with reviewing an audio component? Well, this memory was very much in keeping with my reaction to the Ypsilon Phaethon integrated amp. It’s a component of such musical color that it intensifies and stimulates and recalibrates one’s audio senses and expectations like few that I’ve encountered before. Greece is home to Ypsilon, a boutique high-end manufacturer of renown. The small firm’s output is modest, even by high-end industry standards. But since the company’s formation in 1995, and under the guidance of founder and chief designer Demetris Baklavas, Ypsilon has achieved a reputation that makes it a part of any serious conversation of what it means to be state of the art. 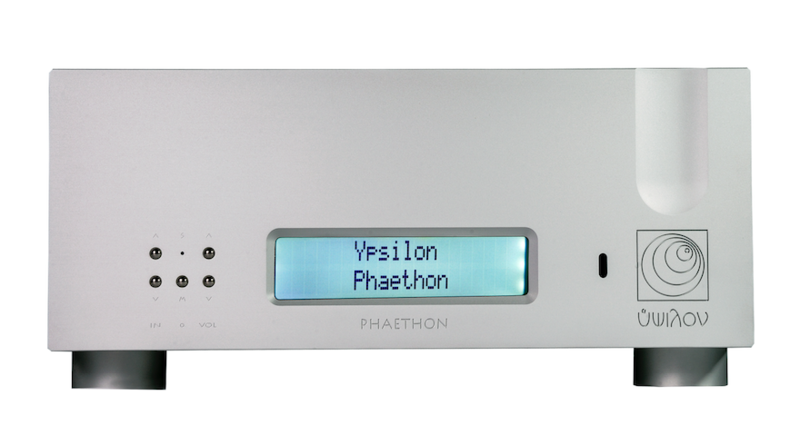 The Phaethon is Ypsilon’s sole integrated amplifier. The look is minimalist and purposeful and elegant. In my experience, its build-quality is on a level reserved for only a handful of elite brands. Tipping the scales at well over seventy pounds, the Phaethon’s seemingly impregnable chassis is made of 10mm plate aluminum with a 20mm front panel. The front panel features six small push-buttons to the left of a central LCD display whose brightly lit characters are readable from across the room. The top panel is well vented, with generous heatsinks adorning the Phaethon’s flanks. The back panel includes inputs for three pairs of unbalanced analog RCA jacks and a single pair of balanced XLR connectors. Top-notch binding posts are by WBT Next-Gen from Germany. The AC power inlet is courtesy of Furutech. All normal functions can also be controlled from an aluminum remote control, a veritable slab of metal that feels as if it weighs as much as some components I’ve owned. Phaethon is a hybrid tube-transistor linestage that sports technologies first observed in Ypsilon’s reference-level Aelius monoblock amplifier and PST100mk2 preamp. Rated output is a conservative 110Wpc into 8 ohms. Minimalism prevails throughout the Phaethon topology. It uses only three active gain stages, two of them with 6H30 low-noise valves operating in single-ended Class A for the input and driver stage. Its “bridged, single-ended” output stage is biased in Class A in what Ypsilon describes as the “first, most important watts.” Ypsilon posits that this arrangement offers the flavor of pure single-ended designs combined with the power of push-pull designs. The output stage uses three matched pairs of MOSFETs of the same polarity operating in exactly the same topology for the two halves of the signal. In total, the Phaethon employs eleven transformers, each one built in-house, plus separate power supplies for the tube and output stages, utilizing five power supply inductors for low-noise filtering. Paramount to the sonic reputation of any preamp stage is the volume control; this is where the delicate audio signal wins or loses. Ypsilon, rather than using the prosaic resistive stepped attenuator or potentiometer, has opted for its own in-house design. It’s a custom and costly transformer attenuator solution that is embedded in the preamplifier section using Ypsilon’s proprietary topology. Similar to the transformer attenuation in the top-line PST100mk2, the Phaethon version uses 31 taps (secondary windings) for up to 58dB of attenuation in steps that range from 3dB to 1.5dB depending on the volume control position. Unlike the typical volume control this arrangement is known for a high level of precision and is completely non-resistive. Turning to sonic performance, the word that first came to mind was earthy. The Phaethon produced a rich, dark sound, anchored by the sort of taut foundation that seemed to extend into imagined bedrock well below the confines of my listening space. Noise was non-existent. While the Phaethon idled, a velvety, black silence prevailed until the music was cued and snapped to life as if having been released from behind floodgates. The experience was lush and expressive with a push of midrange bloom, and rippling with micro and macro energy. It was obvious from the opening of Vaughan Williams’ The Wasps Overture that the Phaethon signature would veer toward a warmer, near-romantic sound imbued with more tonal shadings than a book of Pantone colors. In keeping with the theme of an angry hive, air swirled from the orchestral stage in a flurry. String sections were intricately layered, solo instruments appropriately focused but fully integrated within the warm body of the orchestra. In particular, wood-bodied instruments such as cello, bass viol, or bassoon were fat with harmonics. But as much detail as the Ypsilon coaxed from a performance (and there was an awful lot) it never lost its grasp on the bigger sonic picture, or reduced music reproduction to an intellectual exercise or lengthy checklist of audio criteria. The sheer quiet of the backgrounds played another critical role. Consider the backing cello in Rutter’s Requiem or the concert harp during The Wasps as they softly blend with the orchestra—low-level information like this was never smeared and never lost image focus. Rather, it was expressed in the context of its own unique radiating space untrammeled by any whiff of electronic noise or coloration that can cling like a halo at these quieter levels.